This is the type of salad that you'd have at a Japanese hibachi grill. It would be a good accompaniment to any Asian entree. Combine the carrots, ginger, shallots, soy sauce, vinegar, water, sugar, and vegetable oil in a blender and puree until dressing becomes a slightly thick sauce. Season with the salt. 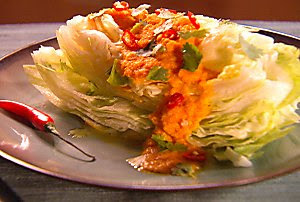 Break the Iceberg wedges a bit to open them up and pour the dressing over top. Finish with cilantro and chile.